Our home is our castle; it is the one place where we should always feel safe. It is therefore very difficult for anyone to imagine someone breaching that feeling of safety. However, with 3.2 million home and vehicle burglaries every year in the United States, it is in fact a very real threat. There are a number of important things that home owners can do to protect themselves and their home from a potential burglary. During home robberies situations preparation is key. Discuss with your family beforehand a possible plan of action if this situation was to arise. Remember that most thieves just want your things and not you, so be sure to stay out of their way to avoid harm. Get into a safe place and promptly dial 911. When calling, make sure to give the authorities your location as well as detailed description of the event. If you are in your bedroom and an intruder walks in, it is often best to pretend to be asleep; therefore you can usually avoid a confrontation. 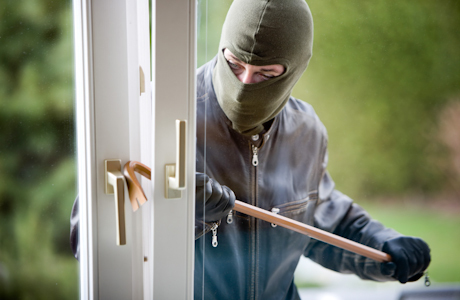 If you notice an intruder in your home making a little noise, such as dropping a shoe, plate, or even honking the horn, can be enough to scare most intruders as they will realize that your home may not be the quick and easy target that they may have initially anticipated. Most importantly remain calm and have a few emergency supplies with you, such as car keys, flashlight or even a weapon which can be used to defend yourself and your family if need be. This ideally would be the last course of action, once the authorities have been alerted. The best way to deal with a potential robbery is to prevent it. There are a number of surveillance and security systems designed to keep you safe. Find one that works for you.